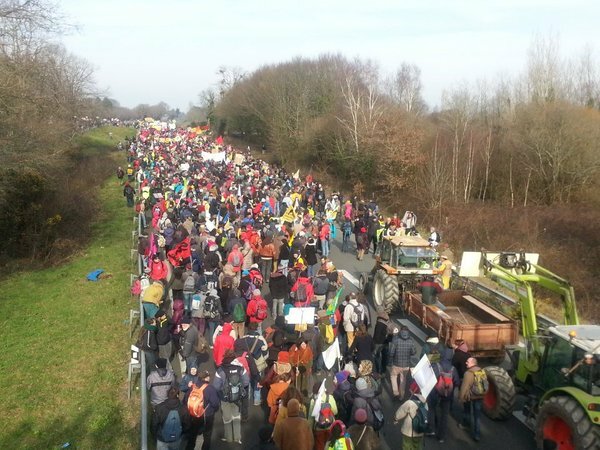 A mass mobilisation brought tens of thousands of Nantais and people from across France together on two roads in Bretagne, the 4 lane Nantes-Vannes and Nantes-Rennes, to oppose the construction of the Notre-Dame-Des-Landes (NDDL) new airport project by construction company Vinci 30 km north of Nantes. The project is widely seen as climaticide and not compatible with France’s commitment to the #COP21 Paris Agreement on climate change. It is hard to justify a new airport near Nantes when the runways are far from capacity. But Perhaps the passenger terminal of the existing airport may need an upgrade. Nantes is also only 2h 15mins by the high speed TGV train from Paris. French President Francois Hollande announced on February 11 a regional referendum would be held later this years to settle whether the project would proceed or not. Plans for the airport construction have existed for some 50 years. The airport is strongly supported by Bruno Retailleau, President of the Regional Council of Pays-de-la-Loire, controlled by the right wing Republican Party and the far right Front Nationale. 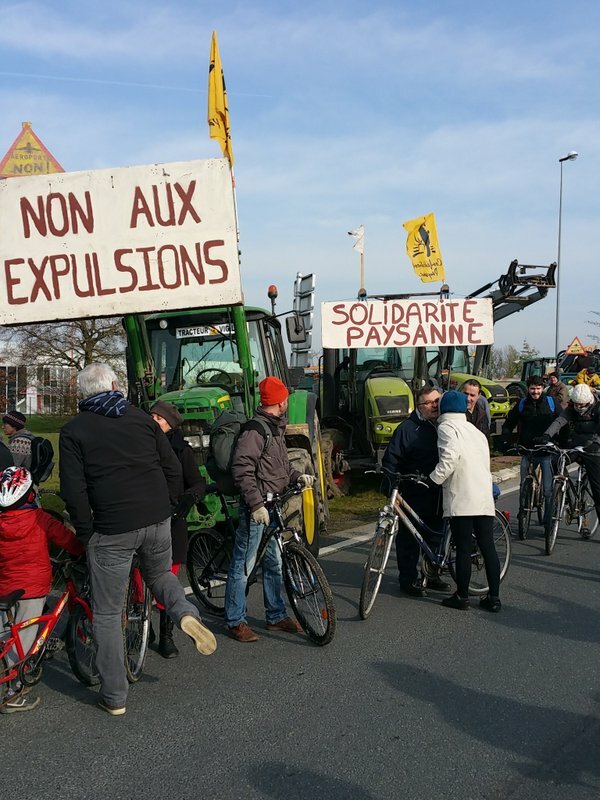 Tractors and cyclists blocked Nantes-Rennes National Road 137 on Saturday before joining the main protest on the 4 lane dual carriageway Nantes-Vannes national road 165. Farmer and Greens Member of the European Parliament (MEP) Jose Bove articulated the contradiction of climate action arising from COP21 in Paris in December and building a new airport. He also questioned the necessity of putting the issue to a regional referendum, announced by Presidente Hollande on 11 February. “Mobilization was never seen like this in Notre-Dame-es-Landes”, welcomed Dominique Fresneau, co-chair of the ACIPA, one of the main opponents of the airport construction. Lorelei Limousin from the Climate Action Network highlighted the hypocrisy in proceeding with this project as being incompatible with the Paris Agreement. “The Paris agreement, which we committed to contain global warming well below 2 degrees C at the end of the century, has now become a reality,” she says. “In this context, a new airport is not consistent and would encourage strong airline greenhouse gas emissions. Especially in a country that already has more than 140 airports – More than Britain and Germany combined.” Limousin said. “The commitment in the Paris agreement is not compatible with the construction of an airport at Notre Dame des Landes nearly 2,000 hectares of farmland and natural areas (inhabited by many protected species), which would generate extra emissions from aviation, concreting of one of the largest wetlands in the country, and the destruction of peasant farms. “For over 40 years, the project of Notre Dame des Landes airport arouses strong opposition from farmers and cooperative and farmers, environmental protection associations,inhabitants of the region, trade unionists, and many people across France. On site, opposition to the airport project has created rich experiences in teaching in the field of agro-ecology, permaculture, lightweight housing, etc. Dominique Lebreton, a co-ordination spokeperson for the protest said, “This event is important to show our determination and political show that we are the most numerous,” alluding to the referendum announced by the president. “We have the duty to preserve these lands and the peasants to produce food for tomorrow”, he said reported by Nordnet. President Hollande announced a referendum on the issue on National television on February 11, 2016 to resolve the issue one way or another. “If it’s yes, and the residents want the airport, then everyone will have to accept that decision,” Hollande declared during a primetime television interview with France 2 and TF1. “If it’s no – we all know that it is a project that has been spearheaded by the government, the government will have to assume the consequences.” reported France24. Although October has been mentioned to hold the referendum, it is still not clear exactly who will participate: whether it will include Loire-Atlantique Department or Pays de la Loire Department or Brittany as a whole. 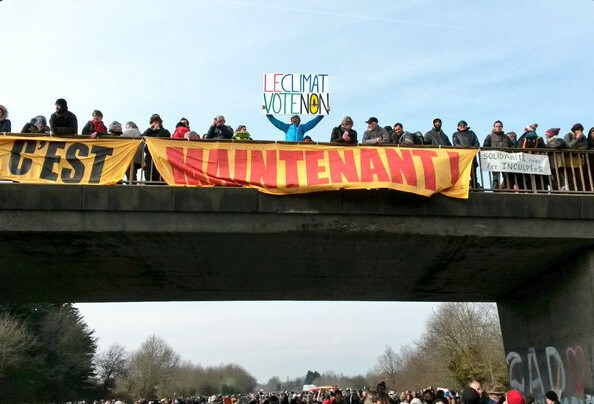 Farmers of the ZAD are still fighting eviction by construction company Vinci. One of the activities of the day was the erection of a lookout tower to provide some advanced warning when construction trucks might move in to mobilize the local community in direct opposition to eviction and construction. Early Estimates of numbers at the rally varied widely with the Prefecture and police saying 10,000 to 15,000 were present at 1pm. The organisers said that 50,000 to 60,000 were present. Some commentators said as many as 70,000 or 80,000 may have been present on the Nantes-Vannes 4 lane (dual carriageway) road, covering a distance of up to 6 kilometres. 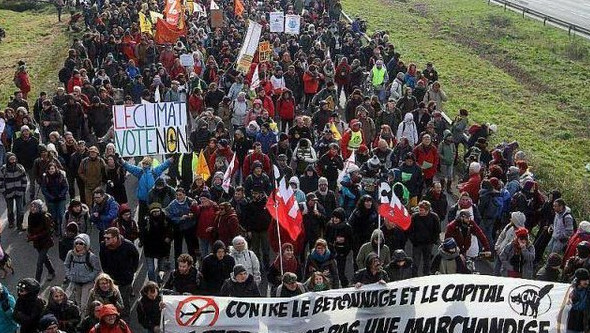 It was announced at the rally that there was 6 kilometers of pedestrian traffic jam on 4 lanes, more than 60,000 demonstrators against #NDDL! JS Herpin, Regional Secretary of the EELV (Greens List) for Orleans, estimated 70 various vehicles, 60 tractors, 2000 cyclists and between 50,000 and 60,000 marchers on foot. David Cormand, Councilor and Chief Metropolitan adviser for Normandy Rouen Metropole and National Secretary of EELV (European Greens List) gave an early estimate of 80,000 people..
Ronan Dantec, an EELV (Greens) Senator for Loire-Atlantique district 44, vice president of the Sustainable Development Committee of the Senate, Councilor of Nantes city, and climate spokesman for the United Cities and Local Government association (UCLG) gave an early crowd estimate of between 50,000 and 100,000 people attending. Certainly many of the photographs show a huge crowd that probably numbered several tens of thousands. Many of those commenting like Chris444 or Ronan Ennis in support of the low prefecture estimates were twitter accounts with few followers and relatively newly created. Essentially they were trolling the protest, obfuscating the issue favouring staunch supporter for the airport project, right wing Republican Senator Bruno Retailleau and Construction Company Vinci. There were support actions in other cities as well. 250 people in Lyon drew attention to the climate impact of the NDDL airport project. They denounced the project as climaticide, as hypocrisy given the successful Paris agreement on climate change that French diplomacy was able to achieve in December 2015. In Chambery 8000 gathered in solidarity with #NDDL protest. Lille also rallied in support of NDDL protest. In London 3 members of the Heathrow13 held a vigil outside Vinci’s London offices. Members of the Heathrow 13 also joined the NDDL protest in France. The Heathrow 13 protesters where found guilty of aggravated trespass at Heathrow airport protesting a third runway, and were sentenced to 6 week suspended sentences for a 12 month period + community service + fines. There was also Solidarity from afar including a protest outside the French consulate in Turkey. 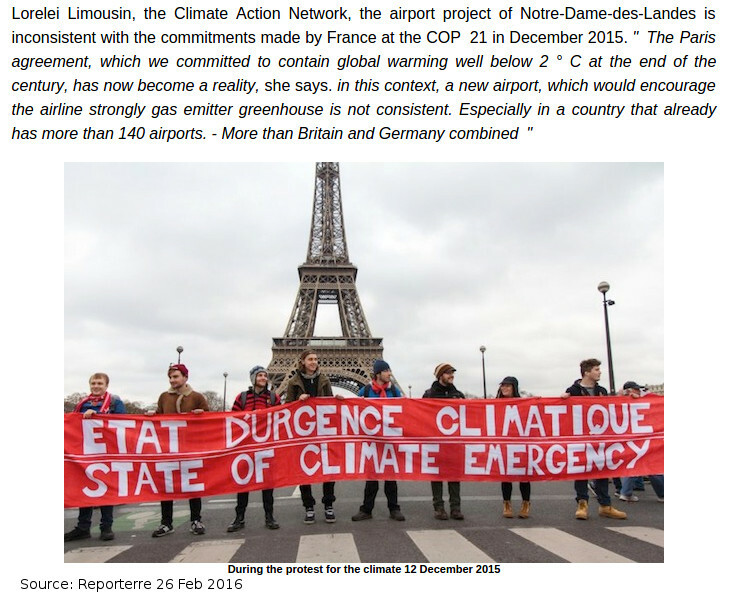 On Friday Nobel prize winning (2007) French climatologist Jean Jouzel reiterated his support for the anti-airport movement. Jean Jouzel also signed the petition calling to “relinquish building the airport of Notre-Dame-des-Landes” and to “respect the commitments made ​​at the COP21” with the text of the declaration organised by NGO 350.org. Nearly 20 000 people, including a dozen personalities have signed the petition, including the writer Virginie Despentes, Green MEP José Bové, former ministers Delphine Batho, Aurélie Filipetti, Cécile Duflot Corinne Lepage, the director of the documentary “Tomorrow,” Cyril Dion, the writer Erri de Luca, and the Canadian journalist and climate activist Naomi Klein. You can add your own name to the statement/petition at 350.org in solidarity with French anti-airport #NDDL activists.